Pearl sugar always reminds me of little snowflakes. I use it often on cookies and breads at Christmas. It always looks so festive! 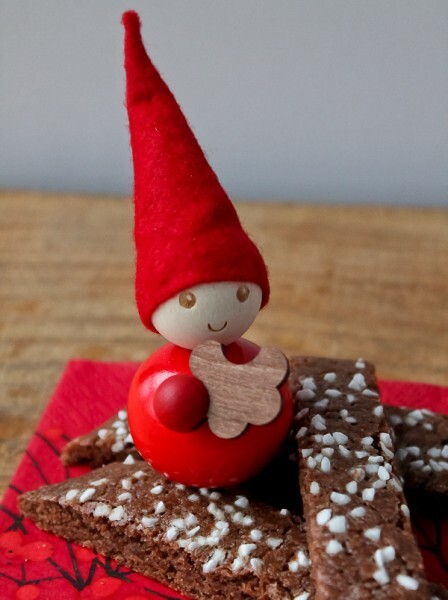 These chocolate slices are easy, so if you are making some last minute cookies these are a good choice. I think my little elf friend here agrees. In large bowl of electric mixer, cream together butter and sugar until light and fluffy. Add eggs, one at a time, and beat well after each addition. Blend in vanilla. In a separate bowl mix together flour, cocoa powder, baking powder, and salt. Add to butter mixture and mix until blended. Cover bowl and refrigerate until cold enough to roll into logs. Heat oven to 375 degrees. Line 2 large baking sheets with parchment paper. Divide the dough into 4 equal parts and roll each part into logs about 12 inches long and place 2 each on prepared baking sheets, leaving at least 3 inches between logs. Press down the logs and flatten to about 2 inches wide and about ½ inch thick. Brush each log, one at a time, with beaten egg white and sprinkle with pearl sugar; press sugar lightly into dough so it adheres. Bake about 12-15 minutes. Remove from oven and while still warm, cut each log diagonally into slices. Place slices on wire racks to cool completely. Store in airtight containers. Makes about 48 cookies. I’ve never seen or heard of “pearl sugar”. Very pretty and festive! I love knowing where a recipe comes from. Do you remember where you found this recipe? I enjoy your website; it’s bookmarked as one of my favorites. Thank you, Denise! I’m glad you enjoy the site. 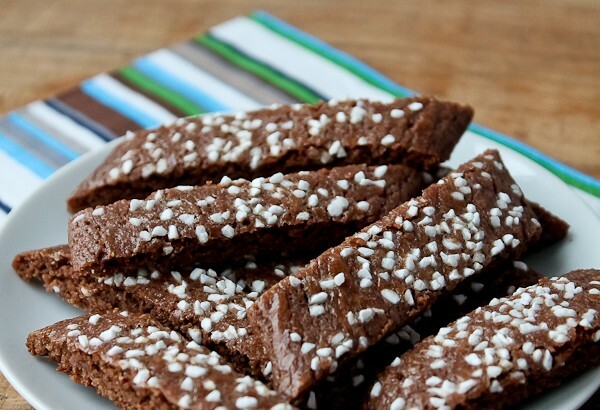 When we learned of the wonderful “Slice Cookies” from our relatives in Finland, I searched for similar recipes in Scandinavian cookbooks and found that there are many variations, including the chocolate. They are all basically the same.